Colonel, 30th U. S. Colored Troops. Highest rank attained: Bvt. Brig Gen.
Born in Schoharie Co., N. Y., in 1810. About two hours after the explosion of the mine, General Edward Ferrero, who had expressed the opinion that it would be inadvisable to take his division of colored troops to the Crater, was peremptorily ordered by General Burnside to lead his division at once into the “hell’s hole.” In compliance with this order the Thirtieth U. S. Colored Infantry immediately advanced, led by its gallant commander, Colonel Delevan Bates. “Under the range of a score of cannon with a perfect maelstrom of rebel lead sweeping the area, the colored men went with a dash against the line of earthworks filled with the veterans of many battle-fields. Their bravery was of the highest grade and before the charge was ended two hundred yards of breastworks, covered ways and bomb proofs were captured in a hand-to-hand combat and several hundred prisoners with a stand of colors were sent to the rear. Adjutant, 30th U. S. Colored Troops. 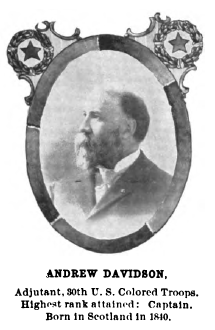 Born in Scotland in 1840. 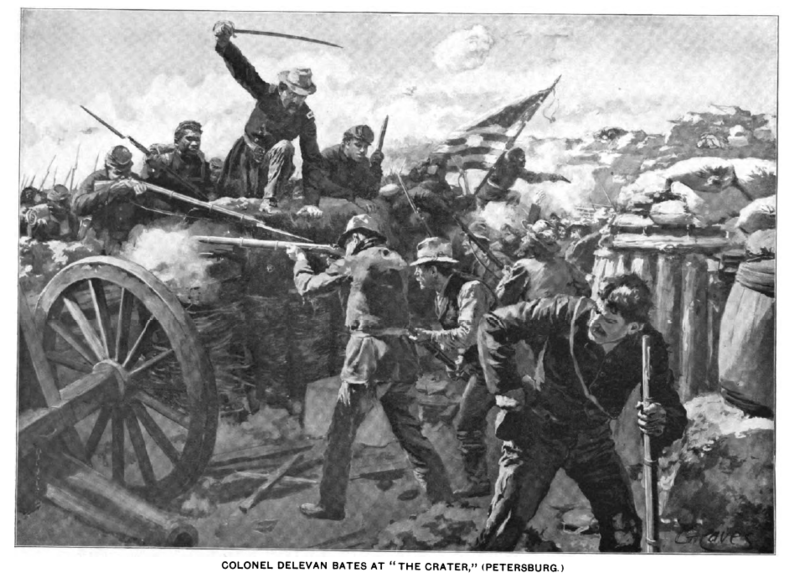 “At this juncture there came orders for another charge on a Confederate battery several hundred yards nearer the city of Petersburg. Again the Thirtieth, led by its commander, was under way. Subjected to a galling fire from batteries on the flanks and from infantry fire in front and partly on the flank, an attempt was made to execute the order. 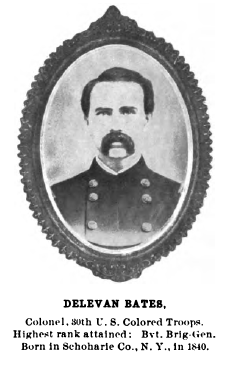 Colonel Bates was shot through the head, dangerously, but not fatally; Major Leeke was killed; Captain Seagraves had his leg shattered by a bullet but, refusing to surrender, killed and wounded six Confederates, and was found with seven deadly wounds on his person. His men fought for his body like tigers, but without success, several of them being found dead by his side. The color-guards were annihilated, one after another seizing the flag as their comrades fell dead and, finally broken up and in disorder, the rest fell back to the line from whence they started. Eight company officers were killed or wounded and two were taken prisoners; while 212 enlisted men of the regiment were killed or wounded. This was the record of a body of troops never under heavy fire before, a regiment of heroes, led by officers who know no fear.